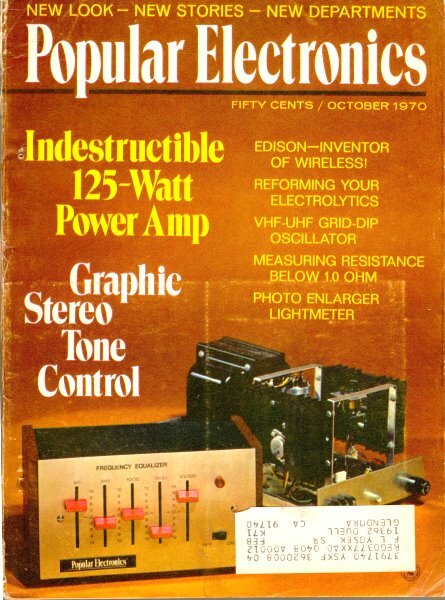 Popular Electronics ran a monthly news roundup feature titled, simply, "Communications." Included were tidbits on CB, SWL, HAM, RTTY, FAX, TV, SSB, AM, FM, CW, and ISB. I know that because those are the acronyms in the string along the perimeter of the page's title. 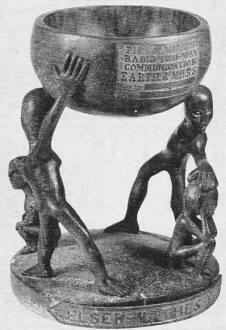 This particular column was chosen because of the weird-looking Elser-Mathes Cup that will commemorate the 1st amateur radio 2-way communications between Earth and Mars." I thought it was an artifact of some primitive tribe's religious rite, but in fact those are Martians in the carving, not Earthly savages. The inscription reads, not surprisingly "First Amateur Radio Two-Way Communications Earth and Mars." No one has been able to claim the trophy yet, but rumor has it Elon Musk might do so before he dies. BTW, ISB stands for Independent SideBand. Broadcasters Change Frequencies - The majority of the international broadcasting stations shift to winter/summer frequencies and schedules on November 1. Broadcasters make four primary schedule changes each year (March, May, September, and November). In view of the now rapidly declining sunspot cycle, shortwave listeners may expect to hear more crowding on the lower frequencies - particularly 31, 25, and 19 meters, Many of the broadcasters have abandoned 11 meters and a drastic curtailment of broadcasting on 13 meters is expected in 1971. Planet Mars QSO - Visitors to the headquarters of the American Radio Relay League, Inc. Newington, Conn., continue to be intrigued by one of the most unusual trophies offered to ham radio operators, It is the Elser-Mathes Cup that will commemorate the "First Amateur Radio Two-Way Communications Earth and Mars." Donated by Colonel Fred Elser, W6FB/W7OX and. Lt. Cmdr. Stanley Mathes, K1CY (deceased), the cup also honors Hiram Percy Maxim (founder of the ARRL), who had an intense interest in communicating with Mars and Venus. When donated to the ARRL in 1929, the idea of ham radio reaching even the moon was considered impractical, but ham-style E-M-E (earth-moon-earth) reflected communications are now almost commonplace. Maybe the first man on Mars will be a ham. If so, his trophy is all ready and waiting for him. A Reading from on High - The FCC has been requested by Readex Electronics, Inc. to establish a wholly new radio service called "Industrial Telemetry." Readex wants assignments in the 216-220-MHz band for miniature low-power transmitters, plus frequencies for a 5-watt command unit. The miniature transmitters would be installed by utility companies and connected to water, electric and gas meters. Information on customer usage would be put in digital code and the miniature transmitters interrogated by a command unit in a high-flying plane! Readex says that an area of tell thousand square miles can be covered in one flight and the readings would be recorded on tape. Big Brother and 1984 are getting closer! Novice or Technician Exams - Would-be hams in the state of Washington may take their Novice or Technician class exams at one of the following locations: Amateur Radio Supply Co., 6213 13th Ave. South, Seattle; G&C Electronics, 2502 Jefferson St., Tacoma; and HCJ Electronics, 8214 Sprague Ave., Spokane. R. E. Aspinwall, W7PV, says exams are year-round. Channel 11-Now that the matter of channel 9 (exclusively for emergency traffic) has been settled, REACT National Headquarters bas proposed voluntary nationwide adoption of channel 11 for inter-licensee calling. Emphasizing that channel 9 had originally been used for intra-station and inter-station calling, a new, nationally recognized "calling" frequency must be sought. REACT says that channel 11 appears to be an agreeable choice to most clubs, REACT teams, and CB magazines, Popular Electronics agrees also. Due to lack of space, we omitted Keith Glover's picture from last month's interview with Richard Wood. Still looks good, though, so here it is now. 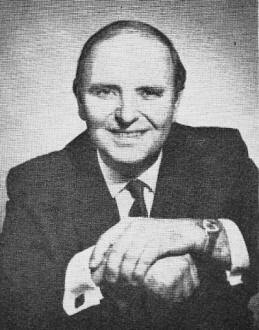 Clarification-Radio Nederland' s Tom Meyer bas corrected some misinformation that appeared in Hank Bennett's June 1970 SWL column. First, tape recordings to Radio Nederland for verification need not be Only 7 1/2 in./s; but may be any speed, any track arrangement, and even in cassettes. Also, Tom's show is not a listener's request program, although he is filing away his regular listeners' preferences (and birthdays)., Musical requests are handled by Jerry and Dody Cowan's "His and Hers" on Tuesdays and "By Request" on Mondays and Fridays. Jamming It Up - The Sino-Soviet communist block countries are gradually intensifying jamming of international shortwave broadcasts. Practically all broadcasts beamed to the Soviet Union and mainland China are being jammed. On August 1, a sweep across the 19-meter band showed jamming on the following frequencies (practically a new high) : 15,105; 15,115; 15,125; 15,130; 15,145; 15,170; 15,205; 15,215; 15,225; 15,260; 15,280; 15,290; 15,300; 15,340; 15,370; 15,380; 15,390; 15,440; and 15,445 MHz. Because of the splatter, this means that about 25 percent of the possible broadcasting frequencies are useless. Chicom 1 - Space scientists are still perplexed by the telemetry from mainland China's 380-lb satellite Chicom 1. Some specialists claim that it wasn't telemetry at all - simply the tag end of a tape recording made to sound like something important. Thousands of SWL's heard Chicom 1 on 20.009 MHz during its short life - an indication that battery power was used in this 5-plus-watt transmitter. Tape recordings mailed by SWL's to Peking have not been acknowledged - according to the latest information - much less "verified." Experts are now partially convinced that the 20.009-MHz frequency was chosen not out of respect for the ITU, but as a convenience since Peking monitors the Soviet Cosmos series on 19.995 and 20.005 MHz. Unique Noise Silencer - Introduction of the "Noise Eliminator" Model CE-0-05 by Omega-t Systems Inc., opens exciting new possibilities in mobile operation. Intended to supplement the built-in CB transceiver noise limiter, the Omega-t solid-state (18 transistors, 1 IC and 11 diodes) device enables 100% copy of weak signals even in the midst of a traffic jam. Besides eliminating noise, the unit also acts as an r-f preselector. Basic operation (patent pending) is to take incoming signal and compare it with noise on a nearby frequency. It then makes pulses from the noise bursts and, when pulses exceed a preset level (adjustable by operator), shifts the received frequency, which effectively switches off the preselect or and quiets the transceiver. Only three connections are necessary to use the unit: antenna in, antenna out, and 12-volt dc power. They Can't Do That To Us - Canadian shortwave listeners, police and fire signal buffs, feel that their Department of Communications has "flipped." In an apparent, but ill-advised, effort to stop unrestricted listening to police radio signals, the DOC has issued a new ruling that requires an SWL to have a "Private Commercial Receiving" license in order to listen to anything above 138 MHz. And, to add insult to injury, the SWL must also have permission from the stations he wants to hear in order to be granted the special license. According to reports in the Canadian magazine Electron, Department of Communications inspectors are not paying a great deal of attention to this new rule. Death of a Radar Echo - Try, try again, scientists are working on a "different" approach to the absorption of UHF radar signals. Laboratory tests indicate that a ballistic missile with recessed resonant antennas beneath an aerodynamically true - but transparent skin - will absorb UHF energy. If enough is absorbed, the echo return can be weakened to a point where detection at great distances is impossible. Stumbling blocks to implementing this idea concern not only mechanics of preparing missile skin, but determining Sino-Soviet radar frequencies. Speech Scramblers - Next year we can celebrate the 70th anniversary of first attempts at electronic speech scrambling - Alexander Graham Bell tried it, but the results were unimpressive. Local and state police are increasingly concerned over the influx of VHF /UHF monitoring receivers and speech scrambling is being installed in an average of three police communications systems per month. The E. F. Johnson Co. has demonstrated a hand-held VHF transceiver with 6 possible modes of scrambling. It will sell for about $1000 per unit - not considered too high for the extra security. Scrambling can be speech inversion, band splitting, frequency modulation, analog, or time division. Band splitting was used during World War II for supposedly secure messages between Roosevelt and Churchill, but the Nazis managed to unscramble it. Canadians Get CB Reciprocity - In a sudden unexpected move, the FCC on July 24, granted CB reciprocal operating privileges to all Canadians coming into the U.S. with bona fide GRS licenses. CB'ers from the States have been able to operate in Canada for several years and a reciprocal arrangement had been advocated by numerous CB organizations. Canadians must request permission using FCC Form 410 (New Form 410-B after November 1) and should understand the FCC Part 95 CB Rules and Regulations. While in the States, Canadians use their "XM" callsigns followed by a geographical identification (city and state).